6 June/July 2018 unmanned systems inside Attention: All UAS Stakeholders EDITORIAL OPINION Photos courtesy of Jarrett Broder, George Sklivanitis, Intel and Virginia Tech. T he White House's Integration Pilot Program (IPP) could be one of the most important inf luences in the development of the unmanned aircraft industry because it draws all of the classes of stakeholders into a practical problem-solving effort while giving each of them a reason to want it to succeed. On board: • is the federal government, which needs data for the safety-focused regulations it is under enor- mous pressure to produce. • are unmanned companies, which need the free- dom to quickly and economically prototype and test ideas in the real world. • are state, local and tribal communities, which need a real voice in what happens within their borders for reasons of safety, privacy, economic growth and public acceptance. Also, hopefully, onboard soon will be the gen- eral public, which needs some of the solutions that drones enable and the jobs the new industry might offer. Inside Unmanned Systems will be following the IPP program closely. We've gathered information on the teams, their members, their plans at this early stage and who to contact to learn more. We've also learned more about how the Federal Aviation Administration (FAA) sees the program unfolding and what changes and opportunities might arise as the work evolves. All of this available in the story and team profiles that start on page 18. 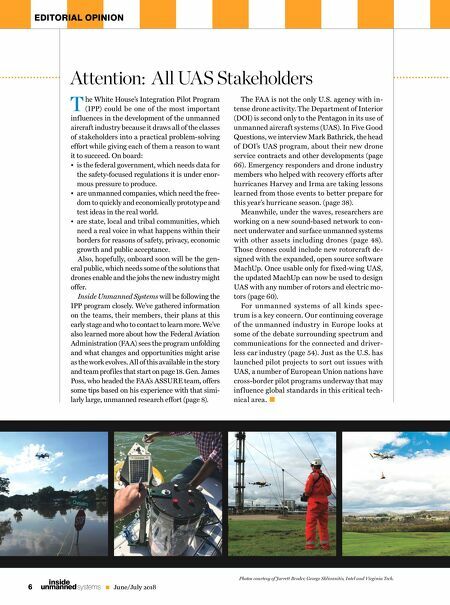 Gen. James Poss, who headed the FAA's ASSURE team, offers some tips based on his experience with that simi- larly large, unmanned research effort (page 8). The FA A is not the only U.S. agency with in- tense drone activity. The Department of Interior (DOI) is second only to the Pentagon in its use of unmanned aircraft systems (UAS). In Five Good Questions, we interview Mark Bathrick, the head of DOI's UAS program, about their new drone service contracts and other developments (page 66). Emergency responders and drone industry members who helped with recovery efforts after hurricanes Harvey and Irma are taking lessons learned from those events to better prepare for this year's hurricane season. (page 38). Meanwhile, under the waves, researchers are working on a new sound-based network to con- nect underwater and surface unmanned systems with other assets including drones (page 48). Those drones could include new rotorcraft de- signed with the expanded, open source software MachUp. 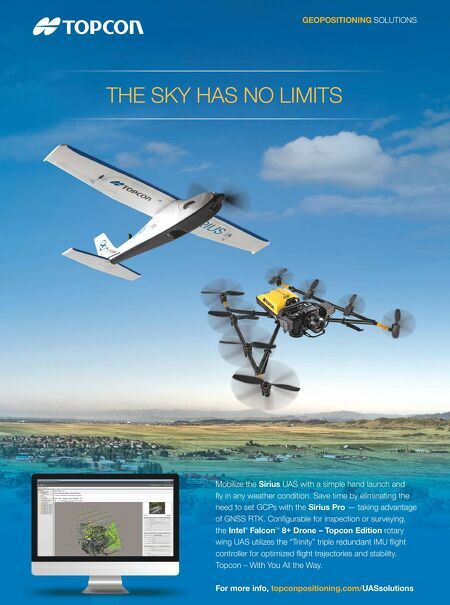 Once usable only for fixed-wing UAS, the updated MachUp can now be used to design UAS with any number of rotors and electric mo- tors (page 60). For unmanned systems of all kinds spec- trum is a key concern. Our continuing coverage of the unmanned industry in Europe looks at some of the debate surrounding spectrum and communications for the connected and driver- less car industry (page 54). Just as the U.S. has launched pilot projects to sort out issues with UAS, a number of European Union nations have cross-border pilot programs underway that may inf luence global standards in this critical tech- nical area.